Hot diggity-dog! Spring begins soon here in the States! (Of course, it stays snowy in MY neck of the woods until almost the end of April!) I don’t know about you, but I like spring because I start to “awaken” with energy as I leave hibernation mode and start ramping up activities to reach my goals. Are you revving your engine and ramping up too? The idea of spring has triggered new growth for ME. As you can see (especially if you follow me on Instagram!) my landscape painting style is continuously evolving into my own…more toward abstraction…little by little. TICKLING YOUR BRAIN? WHAT’S THE DEAL? Paintings are more interesting to look at and are more dynamic when you AREN’T given all the information. This “tickles your brain” and allows your mind to fill in the blanks from your own experiences so you can make the piece your own. In that way your own memories and emotions allow you become an active participant in the art! I’m not as interested in capturing the New England landscape exactly as I see it (we have cameras to do that!) and would rather challenge myself to capture the gesture, energy and mood of a place in as simple a way as possible (using color, shape, line and value). You would be surprised how DIFFICULT this is! I’m trained to SEE with great detail and notice every little color shift as I try to record it. Now, I’m trying to turn OFF that fussy tendency and simplify, simplify, simplify. It takes me out of my comfort zone but makes the art more exciting and electric. I’m trying to SUGGEST details rather than show them. It can be hard to let go, loosen up and trust. Kinda like the advice given to writers: keep it simple and say it in as few words as possible! New work is flowing along and I plan on releasing all new paintings (both small and large in size) soon. Sign up for my email newsletter "Collector's Circle" to get news and find out about exact release dates in advance. I’m so excited about these…I can say they are nostalgic, gritty, honest, and show the more fickle side of the New England land. They are close to my heart and I believe they will resonate in meaningful ways for others. I’m excited to share this evolution with you! As always, thank you so much for coming along on this journey with me. Please do reach out and comment if you have any questions about my process or the art. I’ll be happy to answer! Megan Carty Art for Anthropologie! My longtime dream has come true! I year ago Anthropologie (my favorite store!) 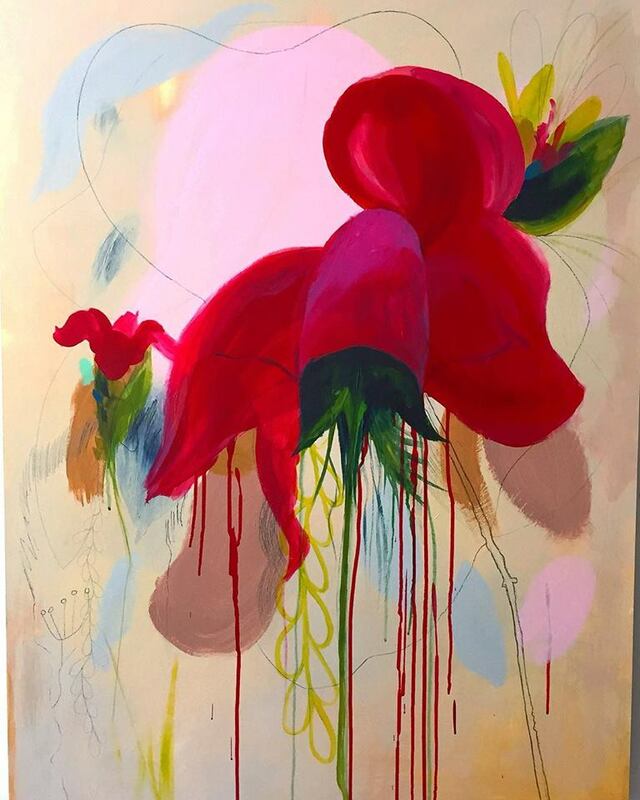 reached out to me to create a beautiful modern and cheerful abstract floral painting for them to use as a huge 3.5 x 7.25 foot paper tapestry! After a long wait, they are now available online to order! This was a wonderful and exciting experience and a huge honor for me. I so hope they do well!!!! I envision putting one in my daughter's room. Click the link to see the Zing and Swing tapestry art by Megan Carty. categories Megan's Artwork, SOLD art! My art is at Anthropologie! I love unique nursery art, so I decided to show what my new floral paintings look like as nursery art prints/kids room art prints. These work great in vintage-inspired decor schemes and add a lot of color and zing! I made them so they come in many sizes from small to large to suit your space needs. They come printed on flat canvas (so they look like the real thing!) and they come to you rolled in a cardboard tube (they don't come framed so you can pick your own AND it saves money in shipping.) The cost of shipping is built into the price. You can check out all the prints I offer here. I'm digging the direction my work has been going lately...abstract but looks like a landscape...I try to convey a sense of time and mood through my use of color. They are like vignettes or memories of a space in time. When I sit down to paint I am usually in a peaceful state where I just finished meditating and I continue that peaceful energy into my painting practice. I look at my colors and then start with whatever I'm most drawn to. I don't plan ahead usually; although sometimes I will see a color palette I love in an inspirational image and I will aim to use those colors. I like to just let intuition take control and see how the piece unfolds on its own. Sometimes working this way makes me nervous, but it's my way of practicing faith...faith in my intuition and in my vision. The other day I bought some acrylic inks to experiment with and I'd say I'm in love with them. It's the joy, permanence and vibrancy of acrylic paint, but the flow of a watercolor. They take some getting used to so far, but I think they are satisfying my artist spirit perfectly. Monday (today) is the day I get a lot done since the kids are in school or with a babysitter until 3:00. So, I have a few hours where I can focus on creating and doing business stuff. I got to sit and paint...just BE so I could work out some ideas that have been collecting moss in my brain. This painting is one of those. I even found time to list several new pieces in the shop and boy, does it feel good to add fresh work! I feel like I can breathe again now that I've cleared out the cobwebs inside myself. Here's a little sneak peek of my latest floral bouquet painting. This one is a small one at 11x14 size but it really packs a colorful punch if I do say so myself! You'll see that even when a flower is pink you can look closely at the colors and see reds in the shadows. I love that about color. It's so sneaky! I hope to have this one up for sale soon; along with some other smaller pieces. Subscribe to my newsletter if you would like to know when these are going to release ahead of time. I’ve just signed a contract with a large art manufacturer called METcolors to license my paintings with them for wall decor and other home goods for sale in retail stores AROUND THE GLOBE! This is something that came to me by luck and chance; but it’s something I used to wish for back when I thought it wasn’t possible. It’s funny how we sometimes close the door on our biggest dreams because they seem so unattainable. What makes us stop trying? Not all that long ago, I started daring to dream again. I started writing my biggest wishes for my work on a piece of paper that I have taped on the wall next to my desk. One of the notes says: “Get art in stores...wall decor, pillows, purses, etc.” About a week later I got an email from a stranger asking me if I was interested in considering licensing my artwork with her company for wall decor, pillows and a few other items. WHAT?! Contracts and many questions on my part later, I am now a licensed artist and my scrawled note on my wall has come to life. Soon you may see my work in a store near you! What are your biggest wishes for your life? Make sure you put them out there…write them down so they have a chance to grow where you planted them! Here I am doing my cheesy victory dance! Ha!